We found inspiration on Pinterest for this project. 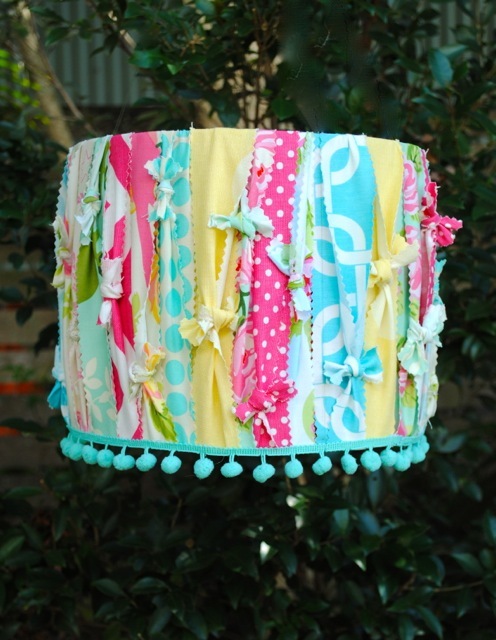 All that is required is some fabric scraps, pinking shears and a lampshade. You don't need your sewing machine for this project. We simply cut leftover fabrics into long strips, wrapped them around the lamp shade and tied them off. Finish off with pom poms. Love this project idea :) And yes, perfect holiday timing!! So tempted to do this! Love it! I am very inspired by this shade! I have recently been looking for the perfect light fitting for my son's bedroom, and I think I have now found the most perfect idea! HAPPY SUNDAY! Home Beautiful Feature & Fabric Giveaway!